I had a productive couple of days. Arkadian AV-1 is now operational as a remote control vehicle. I’m using the StandardFirmata library on the Arduino Mega 2560, with no modifications whatsoever. It was by far the easiest way to get RaspberryPi to control the 4 motors, receive feedback from the 4 sensors (on order from Sparkfun, should be here soon) and have the ability to switch on and off the lights on the robot. The RaspberryPi is loaded with Ladyada’s RPi distro, as it had the latest python library and a few other things that I’m planning on using later on. I have added the PyFirmata library (to control the Arduino) and the OSC library (as described previously) to receive instructions from the OSC pad. 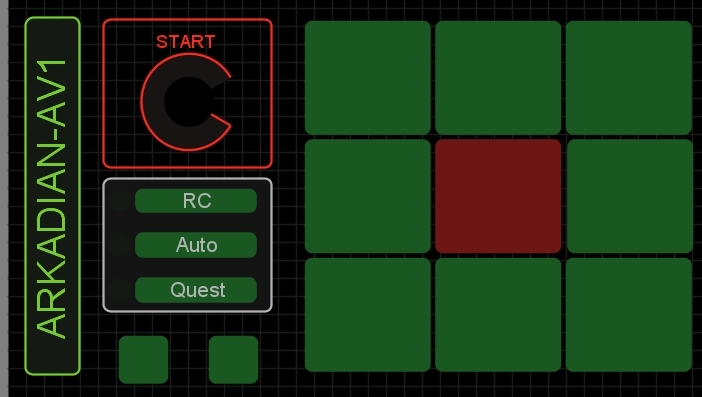 I have been using TouchOSC to create the remote control interface. My original plan was to use the Nexus tablet to control the robot. The problem is that TouchOSC is a bit behind when it comes to Android. The app is available to buy, but you cannot upload your own templates, which makes it pretty useless. I’ll be using an iPad for now, but I hope they get the android version sorted soon. The two buttons under the “Quest”, are for clockwise and anti-clockwise rotation. Vehicle is very responsive and drives really well. Orientation gets a bit tricky for the human brain if the rotation buttons are not used, but for the “Quest Mode” this will really be ideal. I’ll post the code, photos and a video tomorrow. Next week, I’ll finish off the sensors (proximity and compass), tidy up the cables and put everything in a more permanent position. My code needs a bit of tidying up too; it’s really a mess right now (but, hey, it works! ).